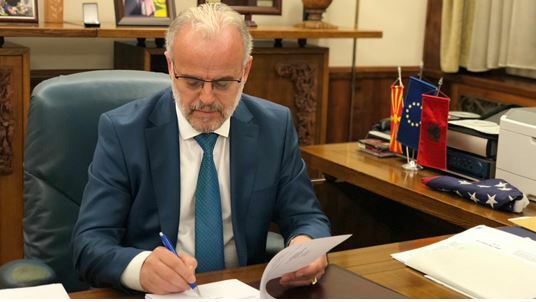 The Parliament Speaker of fYROMacedonia, Talat Xhaferi (photo), is expected to launch tomorrow Friday the presidential election in the country, the first round of which is scheduled for April 21 and the second for May 5. The term of the current President of the country, Gjorge Ivanov, ends on May 12. The term of office of the President of the country lasts five years. At the same time, processes are intensifying in the parties to nominate their candidates in the presidential election. VMRO-DPMNE’s main opposition party will present its candidate at a party meeting to be held on February 16th. Among the most important contenders for VMRO-DPMNE’s nomination, from the nine who have submitted a candidacy, are the Constitutional Law Professor at the Faculty of Law of the University of Skopje, Gordana Siljanovska (64 years old) and the MP of the party, Vlatko Gjorcev (41 years old). In Zoran Zaev’s ruling Social Democratic Union party (SDSM) there seems to be a dilemma about the nomination of his candidate in the presidential election. Indeed, so far no candidate names have been announced. The only thing known is that the SDSM will choose its candidate at a party conference to be held on March 3.